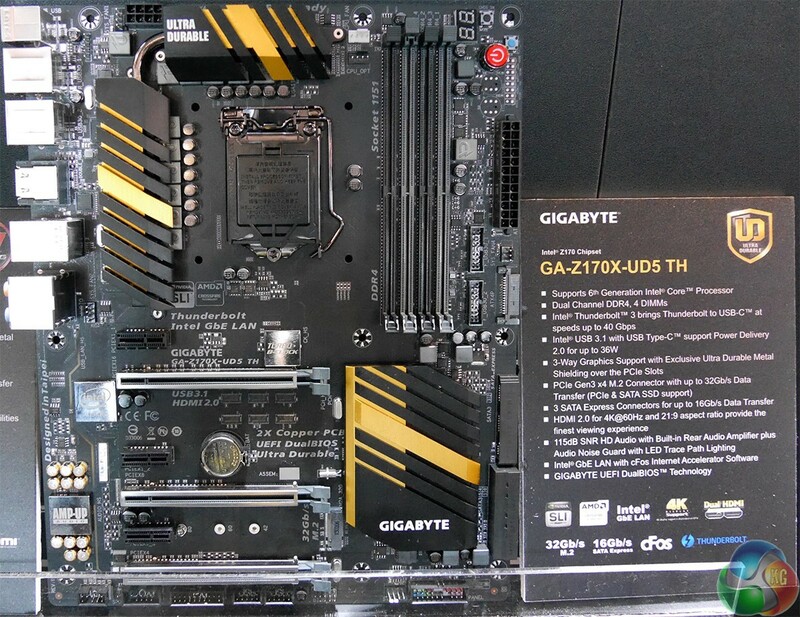 Gigabyte at Computex revealed details about its upcoming premium motherboards based on the Intel Z170. Gigabyte’s premium Intel Z170-based motherboards for LGA1151 microprocessors will all support dual-channel DDR4 memory sub-system, 2-way/3-way/4-way multi-GPU, one or more M.2 slots for solid-state drives with 32Gb/s (4GB/s) maximum bandwidth, one or more SATA Express connectors with 16Gb/s transfer rate, NVMe protocol, Qualcomm Atheros Killer E2200 network controller (G1 Gaming-branded only), Intel “Alpine Ridge” controller for Thunderbolt 3 (40Gb/s) and USB 3.1 (10Gb/s) with type-C receptacle, HDMI 2.0 outputs and advanced 7.1-channel audio. The top-of-the-range Gigabyte GA-Z170X-Gaming G1 mainboard features multi-phase all-digital voltage regulation module (VRM) for CPUs, four PCI Express x16 slots for graphics cards and solid-state drives (shielded for maximum reliability and peace of mind), two M.2 32Gb/s slots for high-end SSDs, three SATA Express connectors with up to 16Gb/s transfer rate, Creative SoundBlaster ZxRi integrated audio, Intel “Alpine Ridge” controller for TB3 and USB 3.1, Qualcomm Atheros Killer E2200 network controller, water-cooling ready heat sink for VRM and so on. 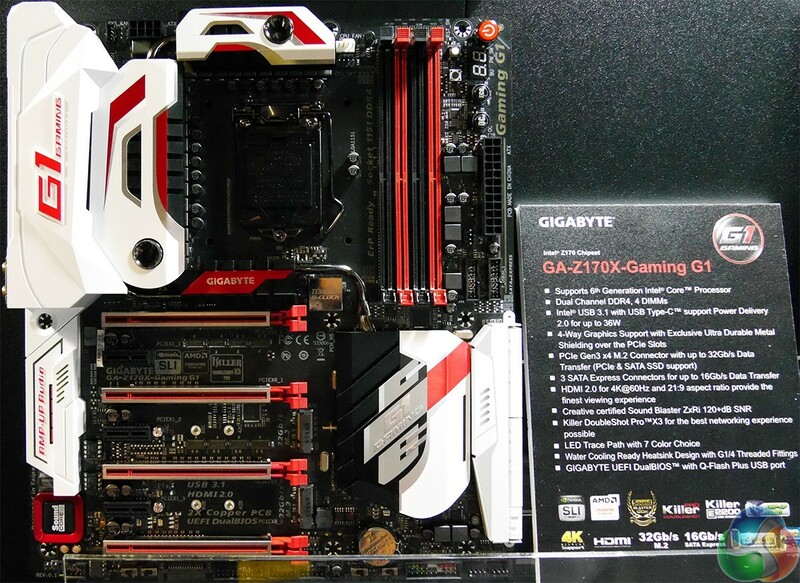 Other Gigabyte Gaming G1 mainboards will be less expensive and will feature lower number of PCIe x16 slots, less M.2 and SATAe connectors, Creative SoundCore 3D audio and so on. For customers with budget constraints, Gigabyte will offer GA-Z170X-UD5 TH UltraDurable-series motherboard that will feature all key premium capabilities (such as, 10-phase digital VRM, 3-way multi-GPU, M.2 32Gb/s, SATAe 16Gb/s, TB3, USB 3.1, GbE, etc. ), but will come without advanced capabilities and design elements aimed at gamers and modders.